Every once in a while I take some time off from my projects in order to re-evaluate my vision. To me a vision is not a destination, but rather a direction. If I blindly follow an old vision I find myself quickly getting lost and losing motivation. This time around, as I re-evaluated my vision, I decided it was time for an upgrade. This was a difficult direction for me to take because of where I've been. I started these projects in order for me to be able to study robotics. My 3d printer and my PCB mill were tools I needed in order to study robotics. I spent two hobby years making them. Now that I have them I am finally in a position to accomplish my original goal of studying robotics. This is why it was tough for me to take yet another step back in order to upgrade my 3d printer. At least this is how I felt until I made the realization that the tools I've been building are themselves robots! So here's my vision. First, what I've already done. As of a month ago my printer worked, but not as well as I wanted it to. I switched to PLA plastic in order to minimize warping and get rid of a raft. I spent days tweaking Skeinforge settings in order to get a better print. I didn't blog about these Skeinforge tweak sessions because I'm under the impression that the problems I was fixing are unique to my extruder. I also added heat sinks to my extruder stepper because it was getting too hot during 8 hour prints. 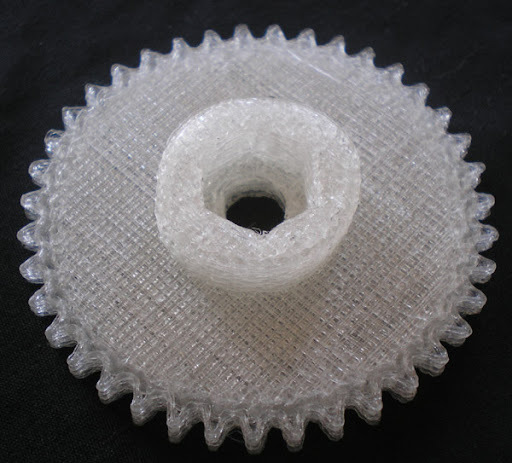 The following is a 39 toothed gear that I recently printed on my RepStrap. 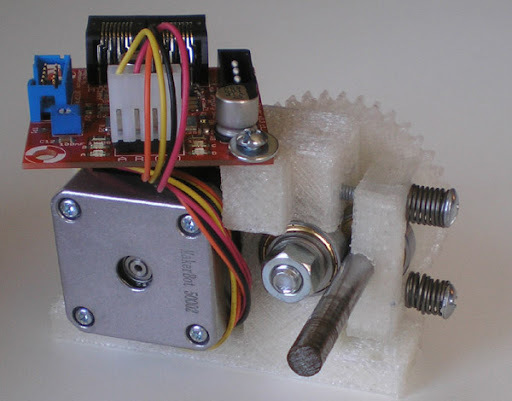 It is a part from Wade's extruder design. Now, what I'm currently doing. This weekend I've been printing a variant of Wade's extruder for my Darwin. I'm using OpenSCAD for all of the parts that I'm redesigning. It's interesting, because I'm able to print the parts I don't need to redesign while I design the new parts and the whole process is going faster than I thought it would. I'm designing and printing parts on the same day. I've done this before, but for some reason if feels really cool today. The following are all of the parts I've printed so far. All I have left to print is the new XCarriage and the parts that connect the heater, carriage, and drive mechanism together. I am redesigning all of the parts in order to get the center of gravity as close as I can to the center of the X guide rods. This should give a faster, more reliable print. Now, for my forward looking vision. 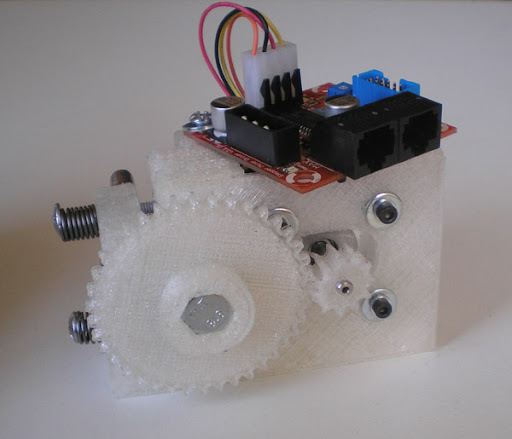 After replacing my extruder on my Darwin RepStrap I am going to use my RepStrap to make a Mendel RepRap. I will then retire my Darwin and possibly make another Mendel. I am moving in this direction for the obvious reasons of getting a better, more reliable, faster print. 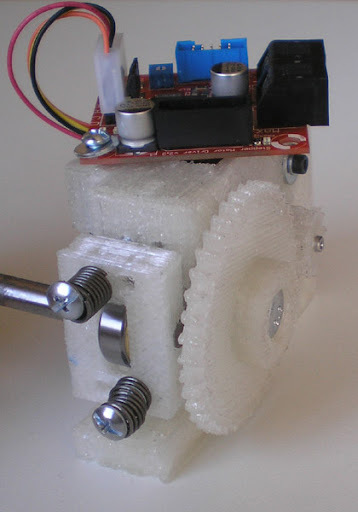 I am also moving in this direction because I think I still have a lot to learn from the RepRap movement. Finally, I am doing this because by doing this I am studying robotics, which is and has been my goal.